Be confident that your money will go directly to supporting our students. Clean Hands for Haiti is a primarily volunteer-run organization, with low operating costs, so you can give knowing that your donation will support the health, educational, and social programs we run. Funds will also become seed money to increase the number of students we can sponsor, continue to ensure a safe community center, and expand our program. We rely on the generosity of our donors to keep our programs running and all donations are 100% tax deductible. Clean Hands for Haiti flagship community service program of A&M Sports Academy, a 501(c)3 non profit. Or give to one of our targeted campaigns. $250 will fund a student's scholarship for a year including tuition and books. $250 will fund the tuition and books for an educational scholarship of a student for an entire year. We want to ensure our students have access to the best possible medical care. In 2018, one of our brightest students had to undergo surgery to remove two large masses found in her breast. Fortunately, the surgery was a success and Sama was able to graduate and will begin university in 2019. 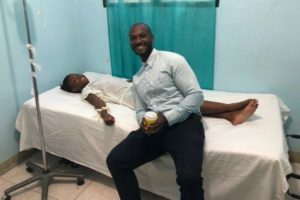 Because of the lack of clean drinking water and other environmental and socioeconomic factors, many of our students may need complex medical procedures in the future. Our hope is to raise capital to partner with specialists so that our students can receive the best possible care. Our historical tours exposes our students to unique experiences and places. In 2017, we launched our history tour initiative, which exposes our students to Haitian cultures and places that they might otherwise not have access to. We have hosted an overnight tour of the historic Citadel Laferrière, a mountaintop fortress located in Cap-Haitien, and a trip to Bassin Bleu, a natural water site near Jacmel with waterfalls and fresh-water pools. We want to hire 2 additional education specialists dedicated to our students. Our staff teacher and student mentor work tirelessly to assist all of our students in after school tutoring. With our growing program, it is becoming more and more difficult for them to support our all students. We would like to hire 2 additional educational specialists to work at the Community Center, with 1 dedicated solely to preparing our students for their university entrance exams. 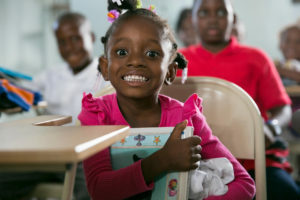 We aim to fund scholarships for 100 additional kids in schools across Haiti by 2020. 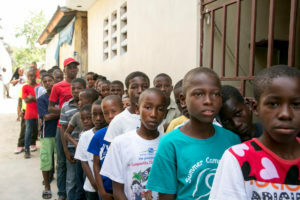 85% of the schools in Haiti are privately owned, making tuition and other fees prohibitively expensive for most families. For families living in rural areas, this is often compounded by challenges in the wake of natural disasters such as the devastating earthquake of 2010 and Hurricane Matthew in 2016. 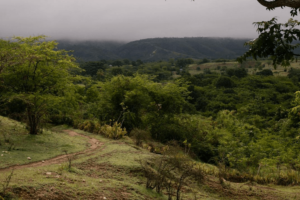 The average cost of yearly tuition in a rural Haitian town is $125 per year. 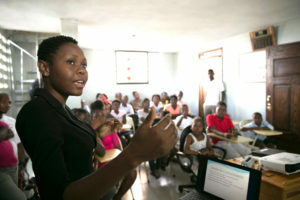 Our goal is to provide scholarships to 100 kids in school across Haiti by 2020. Our 5 year goal is to build a community camp in the countryside. Our five year goal is to purchase 10 aces of land in the countryside and build a community camp with a school, medical center, athletic fields, and agricultural site. This would allow us to serve infinitely more children from all parts of the country and provide many jobs to the local community. Our program extends beyond the classroom to ensure that they have all the resources and support they need to excel in life and in school. We are a small group of committed team members, volunteers, donors, and more. Get to know who we are and why we do this work. During our annual trips, we help set up new initiatives and programs and provide experiences for the community and our students. We are driven by the stories we hear on a daily basis from our staff and students. Check them out and make sure to sign up for our emails. Copyright 2018. 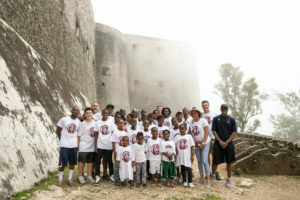 Clean Hands for Haiti is a partnership of A&M Sports Academy. We are a 501(c)3 nonprofit. Photos and site by Lexi.